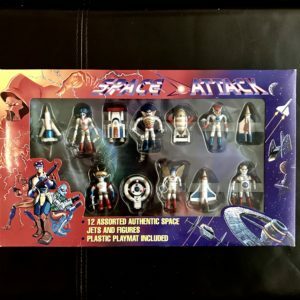 THE SPACE ATTACK PLAYSET IS A COMPILATION OF THE STAR ATTACK BLISTER CARDS CONTAINING ALL 6 OF THE SILVER PAINTED MINI CAKE TOPPER OUTER SPACE MEN AND THE THUNERBIRDS VEHICLES. THESE BOXED SETS HAVE A SLIDE OUT INNER PLASTIC TRAY CONTAINING ALL OF THE MINI KNOCKOFFS. IT IS IN A FANTASTIC WINDOW BOX AND IS VERY RARE TO FIND IN SUCH GREAT CONDITION.